Stamy Paul has used one of the last taboo art genres to make a powerful, positive impact on the city and community. By day, Paul works at Airgas’ division headquarters in Independence as division vice president of human resources. By night (and weekends), she runs Graffiti HeArt, which she founded in 2013 after being inspired by graffiti art, both legal and otherwise, during business trips to Argentina, China and Europe. 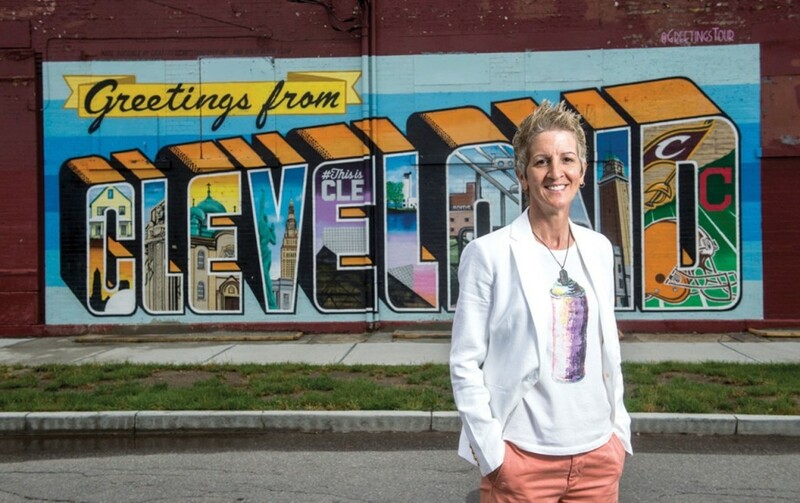 “When I started this organization, there were very few commissioned murals in the Cleveland area outside of Collinwood and a few other areas,” she says. “Cleveland was behind the curve with fully embracing mural installations on large scale, or even considering graffiti as an art form. I wanted this for Cleveland, especially to revitalize areas that may be neglected and need an economic boost. Graffiti HeArt, which is entirely staffed by volunteers, officially debuted in August 2014 during the Gay Games. From there, they’ve helped facilitate numerous mural projects throughout Northeast Ohio, at schools such as CMSD’s Campus International School, as well as at Crocker Park, Tyler Village, Dealer Tire, Airgas and more. And, of course, the Welcome to Cleveland post-card style mural in Ohio City. “I think we can all agree it’s one of my favorites,” she says of the work by New York artist, Victor Ving, with participating local artists Vic Savage and Alan Gilbertson. The explosion of commissioned mural art around the city, from Ohio City to Collinwood, from east to west, has been a welcome addition to the local art scene in recent years. But Paul still loves the good old-fashioned illegal works too. Paul and the other board members are in search of a permanent location in Cleveland that can become the new home for Graffiti HeArt, “a place that would encompass a graffiti gallery, artists’ workspace and workshop to build walls for installation, as well as to host art- and education-related events.” On that front, it should be noted, Graffiti HeArt’s projects help fund scholarships for aspiring young artists to attend the Cleveland Institute of Art’s Pre-College Program, a summer program for high school students to take college-level art and design classes.